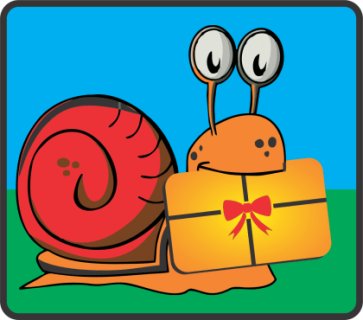 To order your snail to you door, anywhere in the world, simply select the international customer option next to each snail/ item and proceed to checkout as normal. Your order will take a slightly longer time to reach you, but typically takes a week to arrive. Any snails ordered are packed with food for their journey. Hello and welcome to my site! This is site for snail lovers all over the world. I have long been interested in snails of all shapes and sizes, and have had many successful collections over the years. My biggest passion though, was the great Giant African Land Snail. These magnificent creatures are unusual to say the least, and certainly a great talking point! Although these snails are classed as an exotic pet, their popularity in this country is growing fast. They couldn't be easier to look after either, compared to some more traditional pets. Order snails direct to your door anywhere in the world. Download our free care guide for your new slimy friends. View pictures of snails, past and present that we have had up for sale. Order homes and food and accessories for your new slimy friends. Rest assured that your new snail will arrive alive at your door with our arrive alive guarantee. Any help or questions feel free to contact me and receive a swift and fast response. Find me the perfect snail service - want a particular breed of snail? contact us and we can try and get some in stock for you. We are pleased to announce we are now selling gift cards! Want something special for the snail lover in your life but not sure what to choose? Now you don't have to. Buy a gift card instead and let them do the choosing. Available from as little as £5 right up to £50. Email based gift card. Not a physical card. No expiry date. Surprise someone special with a Gift Card! Why not give the snail lover in your life, a gift card! Gift Cards are delivered to the recipient by email and include instructions on how to redeem them at checkout. Our Gift Cards have no additional processing fees and never expire. Available in £5, £10, £15, £20, £30, £40 and £50. Choose which amount at checkout. If there is a particular breed of snail or particular colour you are looking for then please let me know and I will try and find you your perfect snail. Contact me with your desired breed/ colour of snail. Please be aware they don't have the best of shells with some markings due to being wild caught. Please note some have some shell damage.